WILLEMSTAD - Today, Lieutenant Colonel John F. Belo relinquished command of the United States Forward Operating Locations (USFOL) in Curaçao and Aruba to Lieutenant Colonel Jonathan F. McGowen. The Change of Command is a time-honored military tradition which symbolizes the continuation of leadership and unit identity despite the change in individual authority. 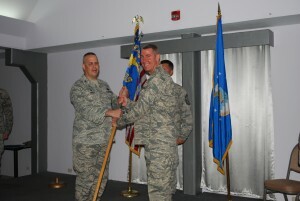 Passing the ceremonial flag from the old commander to the new commander physically represents this transfer. Lieutenant Colonel John F. Belo distinguished himself in the performance of outstanding service to the United States as Commander, Detachment 2, 6l2th Theater Operations Group, Headquarters Twelfth Air Force (Air Forces Southern), Curaçao and Aruba USFOLs during this period. Colonel Belo expertly supported 1,203 joint and multinational personnel operating 69 aircraft, while executing U.S. Southern Command’s counter- drug operations. His leadership and support to 635 intelligence, surveillance, and reconnaissance missions assured the interception of $4.3 billion of illegal narcotics from the region in and around Curacao. Additionally, Colonel Belo oversaw $3.4 million of airfield construction projects enhancing the USFOL’s capability to launch 25% of all Joint lnteragency Task Force-South's air missions, and helped to intercept 69 tons of illicit drugs prior to reaching the U.S.
His successor, Lieutenant Colonel Jonathan McGowen was the Director of Operations of the 552d Training Squadron, 552 Operations Group, 552 Air Control Wing, Tinker Air Force Base, Oklahoma. He was responsible for initial and mission qualification training for all AWACS student crew members. Additionally, he directed, monitored, and reported on AWACS student crew training activities and tactics development. Colonel McGowen directed operations in the largest Programmed Flying Training Operation in Air Combat Command. The USFOLs in Curacao and Aruba, 429th Expeditionary Operations Squadron, supports multinational aircraft operations that conduct detection, monitoring, and tracking missions that play an important role in counter-drug efforts in the region. USFOL Curaçao was established as a result of a multilateral agreement between the Kingdom of the Netherlands and the United States whereby aircraft and crews deploy to the USFOL on a temporary basis to conduct counter-drug operations.